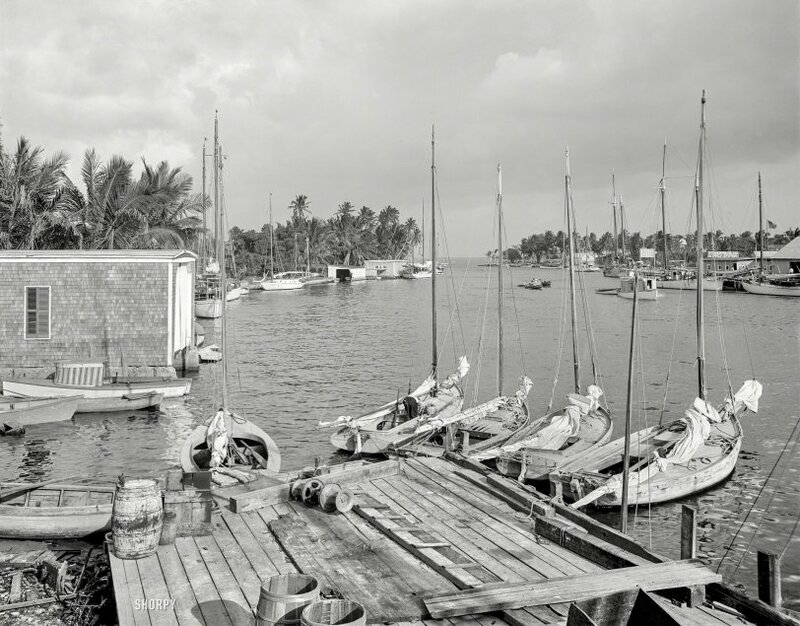 Miami circa 1910. "Mouth of the Miami River and Biscayne Bay." 8x10 inch dry plate glass negative, Detroit Publishing Company. View full size. Submitted by SouthBendModel34 on Mon, 08/11/2014 - 2:06pm. The five small sailing vessels closest to the camera are actual sailing workboats. I believe they are in the shellfish trade. One of them has a sort of "sorting table" to pick through the contents of the [?oyster?] dredge. Note the general lack of "smartness" compared to the dandified yachts in the background. One of them is definitely gaff rigged. The others appear Bermuda-rigged, as neither gaff nor sprit is seen. The one with the broad side decks may be designed for "tonging" shellfish. Next time you have "a tough day at the office", think about how easy you have it compared to eking out a living as a sailing waterman.